We have a staff of talented designers making sure every order looks its best. Don't have artwork, that is not a problem. Sketch out your design or send us a file describing what you're looking for and our designers can create new artwork, or re-create your existing artwork in a printable format. We will do simple typesetting of your name and message at no charge! We offer a virtual sampling service. This allows us to place your artwork, in any item of your choice, in the proper production location. Be it a simple mass distribution item, a garment for your corporate fashion line, or a complex special production. As a result, you already have a realistic idea what your promotional item will look like once it has been manufactured–even before you place an order. On a tight deadline – contact us! We will try our best to find a working solution for you. 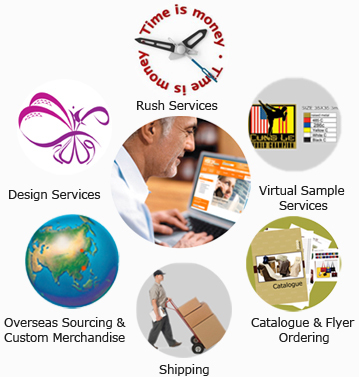 There is usually no rush fee from us, only extra freight charges for faster delivery from Fed Ex or UPS. In addition to our wide array of online ordering options you can also select your products from an easy to use catalogue or flyer to place your order. Simply request our promotional products catalogue or flyer with the order form provided on this website and we will promptly send you a copy! We will ensure all products are packed properly and shipped to your specified destination according to your instructions. To ensure that your products arrive at their destination in personalized packaging and on time, we offer a professional and budget-priced order picking service. Upon request, we will even gift wrap your promotional items or enclose greeting cards, sample products or print material with the package. If you would like a non-binding consultation for more details, please feel free to contact us at any time.